● Seven Samurai: The most famous remake of an Akira Kurosawa film is the western The Magnificent Seven, which is a remake of Seven Samurai. In this case, seven expert gunmen agree to defend a helpless village against Mexican Bandido Eli Wallach and his army of pistoleros. 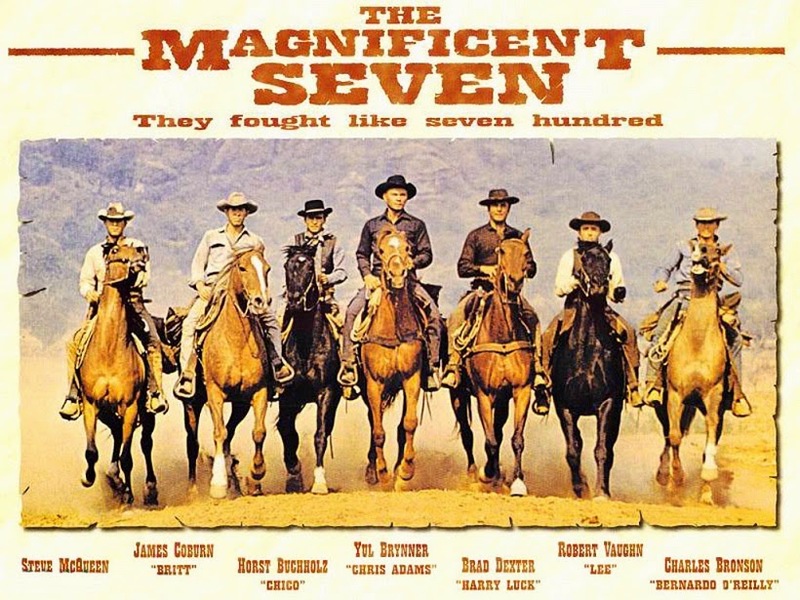 Among the seven are such amazing actors as Yul Brynner, Steve McQueen, Charles Bronson, James Coburn and Robert Vaughn. The film was directed by John Sturgess and is arguably the best western ever made. In fact, not only is the film routinely ranked among the best films of all time, but this is the second most shown film on television behind only The Wizard of Oz. And what makes this film so great is the same thing that made the original so compelling, watching a group of tough, loners and drifters decide to stand for something, not for money, but because they want their lives and talent to have meaning for the first time. Akira's version, by the way, gave us such innovations as the telephoto lens, the use of multiple cameras to capture the same action, and the image of the bad guys riding over the hill to attack. Each of these things had become standard techniques by the time of The Magnificent Seven. ● Yojimbo: This one was remade as a A Fistful of Dollars. Directed by Sergio Leone and starring Clint Eastwood as a man with no name who plays two competing crime families off against each other, this was the film that made Eastwood into a superstar. It would then spawn two more collaborations between Eastwood and Leone -- For A Few Dollars More and The Good, The Bad and the Ugly, which would guarantee his movie star status. 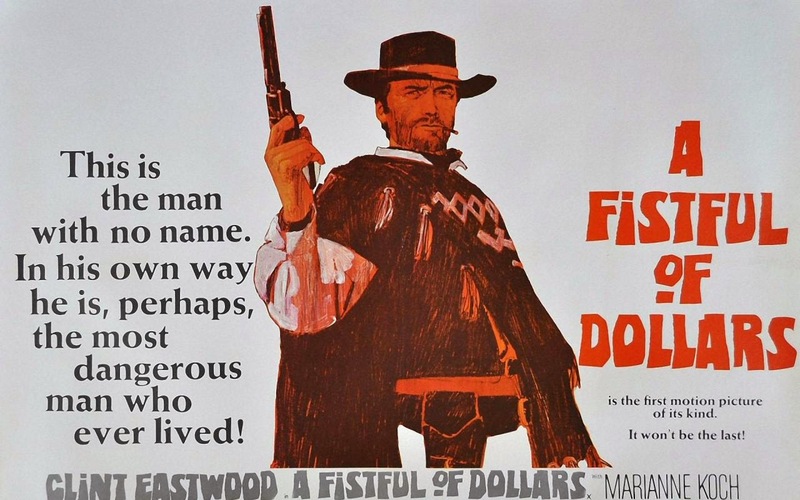 As with Yojimbo, A Fistful of Dollars involves a drifter, gunfighter anti-hero with no apparent conscience, who is undone by the fact that he does really have a conscience. As with many Kurosawa films, the inability of good people to ignore their consciences is a powerful theme he goes to over and over, and it's a theme that calls to all of us... or should. This film was later remade again by Bruce Willis and Walter Hill as Last Man Standing, an overlooked gem. ● The Hidden Fortress: The story of two squabbling peasants who accompany a defeated General who tries to save a princess from an enemy clan, this film wasn't directly remade so much as it was completely re-imagined as a film staring two robots. What film? Star Wars. Seriously. As an aside, the defeated General in Hidden Fortress is played by Toshiro Mifune, who is an amazingly compelling actor and is perhaps the greatest actor Japan has ever produced. He and Kurosawa worked together several times. ● Rashomon: Rashomon was remade by Sydney Lumet for television and then later remade as the film The Outrage, starring Paul Newman, Edward G. Robinson and William Shatner. However, I think the bigger angle is that the concept behind this film has been remade over and over and over. Indeed, what made Rashomon so innovative was the concept itself, which is that the same story is told repeatedly by different characters from different perspectives, with each telling the story slightly differently. This story also involves the use of the unreliable narrator and nonlinear story telling, and is now considered one of the greatest films of all time. That's an impressive lineage. Anyway, join us this week as we talk about our favorite Kurosawa films. 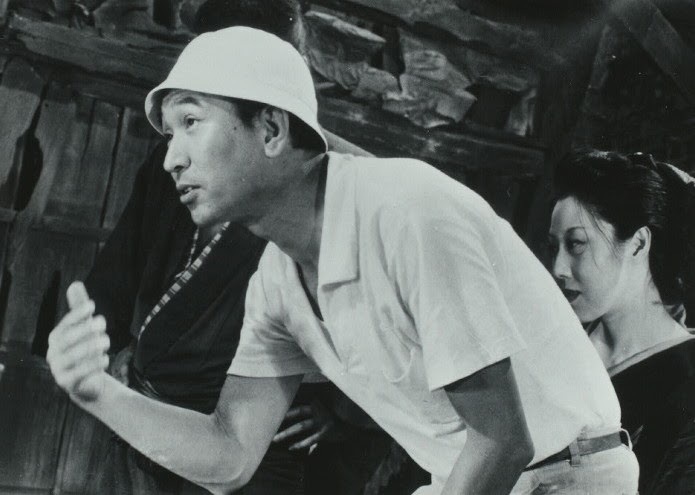 In the meantime, tell us what your favorite Kurosawa films are? Well, I've only seen (so far) Seven Samurai, Ikiru, and Hidden Fortress so it is them in that order. Here are two good videos on Kurosawa's style. Huh. This published a lot earlier than I thought it would. Odd. Kit, All of his movies are good. "This published a lot earlier than I thought it would. Odd." I haven't seen any of Kurosawa's films, so, unfortunately, I can't comment directly. However, I have heard and read enough to have a pretty good idea of how much he's contributed to movies. Truth be said, I've learned most about Kurosawa through the remakes Andrew described. I'm not too big on the westerns. However, I have read a lot about the influence of Kurosawa on George Lucas while reading Michael Kaminsky's "The Secret History of Star Wars." According to this book, Kurosawa's samurai films were a big influence on the treatment and rough drafts. (It's amazing how much Lucas hates writing when you consider the rough draft is about three or four movies long.) The official first draft is a near scene-for-scene remake of "The Hidden Fortress." (Lucas could've just asked 20th Century Fox to buy the rights and stop there.) But he added a whole bunch of other stuff that by the time he reached the shooting script (Fourth Draft, version 2), it wasn't a remake; it only contained a few key elements. Still, according to J.W. 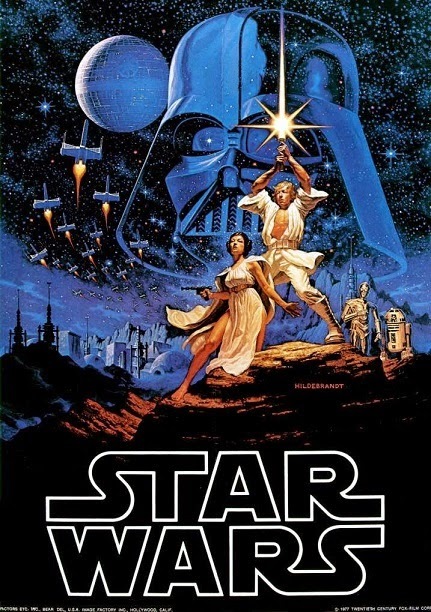 Rinzler's "The Making of Star Wars," Kurosawa loved 'Star Wars.' He also said that he felt honored that his work had inspired such a movie. The other thing I know Kurosawa for is being relieved of directing duties on the Japanese side of things on "Tora! Tora! Tora!" At first, he was hired because he was the best director ion Japan. However, according to producer Richard Fleischer, Kurosawa never fit in. This was a very straightforward film. And Kurosawa wasn't allowed to do whatever he wanted to do (his usual norm); he was a hired director on a film where the executives and producers called all the shots. He was sent home after only two weeks of filming. OT: Based on Andrew and Kit's recommendations from a few months ago, I've been watching the last few episodes of "Once Upon a Time" for the past month. The good news: my fears of it being a "Hercules/Xena" 90's revisited thing were misplaced. I've come around and have found myself really enjoying it! The bad news: Now, I've got to spend the next few months or summer watching all the previous seasons to get caught up. Thanks a lot, guys! I've only actually seen Rashomon and that was 10+ years ago so I was probably too young to appreciate it. It's funny... I think every TV show has done their own Rashomon-style episode. It's a very effective storytelling device. The one I really want to see is The Bad Sleep Well, especially after watching the aforementioned video Kit linked to. I read that Kurosawa enjoyed "The Magnificent Seven" so much he sent the director a samurai sword. Rustbelt, Sadly, Once Upon A Time has lost me after the most recent season. I felt seemed to lose track of itself and become something else. Oh well. You mileage may vary! On Kurosawa and Lucas, I didn't believe Star Wars could have come from a Samurai film until I saw Hidden Fortress and then started to see how the elements of that film were indeed infused into Star Wars. You should check out some of his films, especially if you think of yourself as a film buff. My personal favorite is Ikiru or High and Low. BTW, Rustbelt, I'd heard that about Tora Tora Tora, I also heard there was tremendous bad blood between the American and Japanese crews. Interesting. Good movie though! Michael, I hadn't heard that, but that's fantastic! Kurosawa always did seem like a really nice guy and he seemed to enjoy all the international attention he got... deservedly so too. "He once met with Akira Kurosawa, who told him that he loved The Magnificent Seven (which was a remake of Kurosawa's Seven Samurai) and presented him with a samurai sword. Sturges considered this the proudest moment of his professional career." Rashomon is a must see for any film buff. The only caveat is that seeing his films now has a bit of the "John Carter" problem. His style and technique have been copied by American directors for so many years and so often, that seeing his original looses some of its impact. Michael, That is fantastic. I think it's great to see two amazing directors acknowledge each other. djskit, That is a very good point, and a sad point too. Rashomon is an amazing idea and a great film, but it has been done so much that it is hard to grasp how amazing it must have been to see this concept done for the first time. "yojimbo" and it's Leone equivalent, reminds me of a great definition of the "Spaghetti Western" I read back in the 70s. It was defined as "A western shot in Spain, starring an American, directed by an Italian, based on Japanese stories and funded with West German money."